The Palmer TD0202 Mechanical Hands free Roll Towel Dispenser is compact and easy to load. Put this paper towel dispenser virtually anywhere with it's compact design. There are no levers, or cranks or buttons to push so this eliminates cross contamination. The dispenser fits most universal rolls up to 8" wide and 6" in diameter. 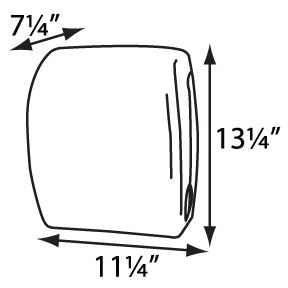 Paper towel dispenser is extremely smooth and quiet and uses low pull force.